The bow tie can – which is not replacing the traditional Budweiser can – has been in development since 2010, though the idea was formed a couple of years prior. The bow tie has been associated with the Budweiser brand since a national advertising campaign in 1956. It took the company a few years to develop the unique shape, McGauley told The Huffington Post. It is moulded at Anheuser-Busch’s metal container facility 90 miles north of New York City. This three-year undertaking involved some significant changes both at the can-making facilities and on the packaging lines. Creating the can requires a 16-step process: ten steps to form the bottom half, with an additional six to form the top. According to the release, the physical limitations of aluminum required the angles of the bow tie to be very precise. The bow tie can actually uses twice the amount of aluminum compared to a traditional can and it costs the company more to manufacture. However, there is slightly less beer in each – 11.3 ounces (334ml), compared to the traditional 12 (355ml) ounces. Each bowtie can holds about 137 calories, which is about 8.5 fewer calories than in a 12-ounce can. The bow tie will be available in an eight-pack rather than a six-pack. This was a strategic decision to get the new shape noticed on shelves. “We look for innovation within our brands, and we look for renovation within our brands,” McGauley explained. The move toward a new shape and new packaging focused on the latter. 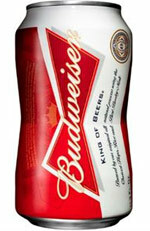 The slightly odd shape of the can isn’t the only new development on which Budweiser has been working. In 10 states, the company is test-marketing a 25-ounce can (739ml), which gives consumers one more ounce of beer than the traditional 24-ounce (701ml) can. Sales of this can will begin over the US summer. While McGauley had no other news to report at this time, he stressed that packaging was an important aspect in Budweiser’s ongoing plans to innovate. More than 10 million cans have already been produced for the spring launch, with another 8 million currently being manufactured this month. The can will be available May 6 in grocery stores, supermarkets, convenience stores and packaged liquor stores.